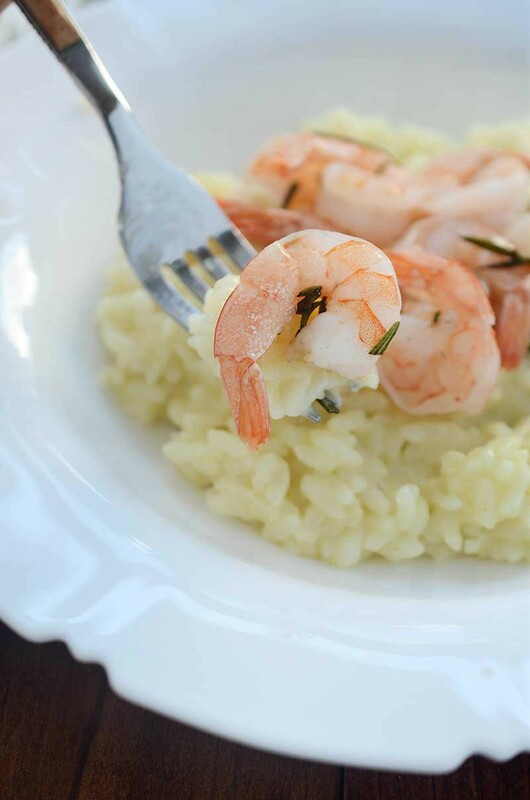 Easy Pressure Cooker Risotto and Rosemary Roasted Shrimp. 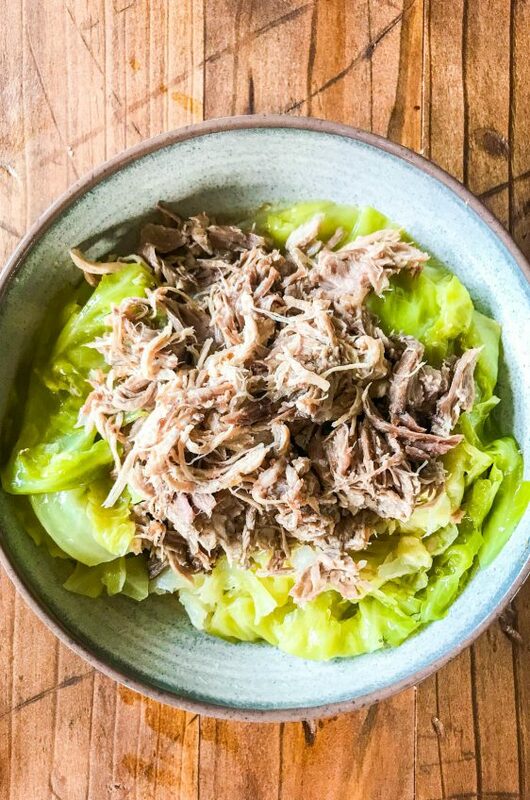 This is a gorgeous and simple meal that is perfect for date night at home AND busy weeknights. 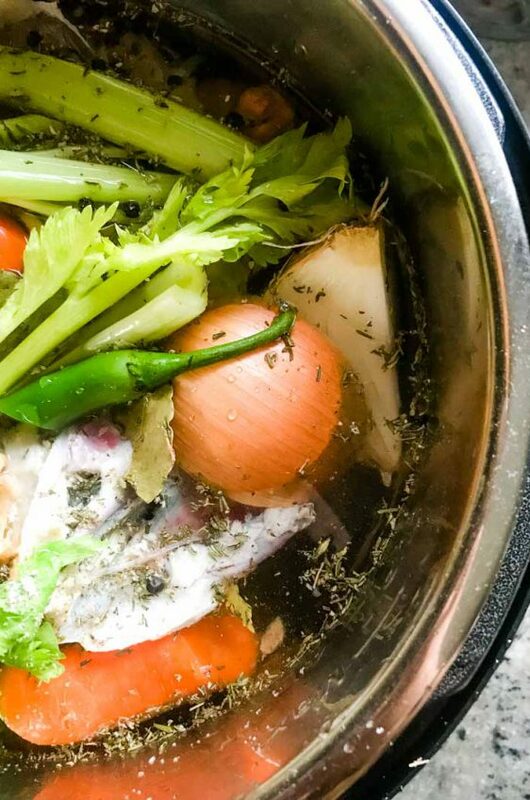 I have been seeing pressure cooker recipes pop up all over the internet. I don’t have a lot of space in my kitchen so I didn’t really think that I needed another thing taking up space. It was because of this that I was probably one of the last people to jump on the Instant Pot bandwagon. But then it was a special on Amazon Prime day and I just couldn’t resist. 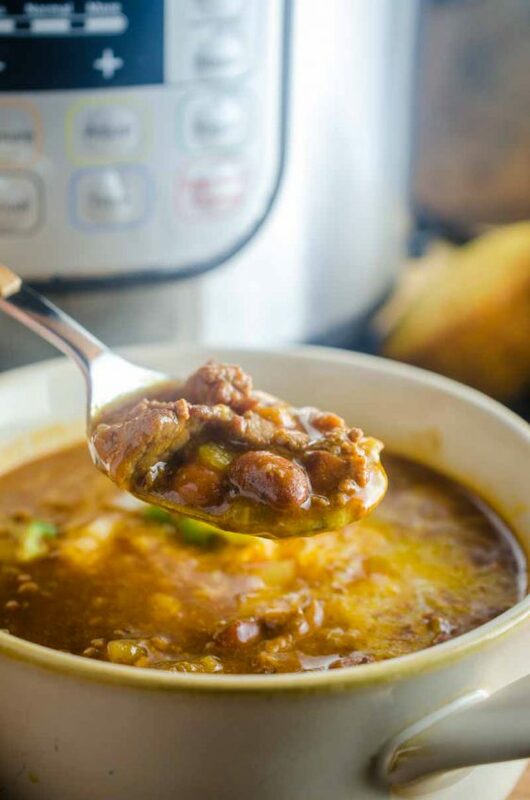 I was one of the 215,000 people that bought an Instant Pot on prime day and I am SO glad I did. I’ve used it a lot already. I’ve made chicken, chicken wings, ribs, rice and my new favorite Pressure Cooker Risotto. Risotto is one of those meals that I really like but I don’t make because it takes so much time. 35 minutes of stirring is not something I have the time to do with two little ones running around. But Pressure Cooker Risotto cooks in under 10 minutes (once the pressure cooker reaches pressure) and there is no, I repeat NO, constant stirring. To make this Pressure Cooker Risotto a main dish, I made some delectable roasted rosemary shrimp to serve along side. They too are easy to make with just shrimp, olive oil, rosemary, garlic and salt and 5 minutes in the oven. Time saving tip: when it comes to cooking shrimp the easy peel and deveined shrimp are the way to go. They might cost a little more but the time you’ll save the in the kitchen is so worth it. The simplicity of this Pressure Cooker Risotto and Roasted Rosemary Shrimp is one of the reasons I love it so much. It is so easy to just throw it all together after a busy work day. 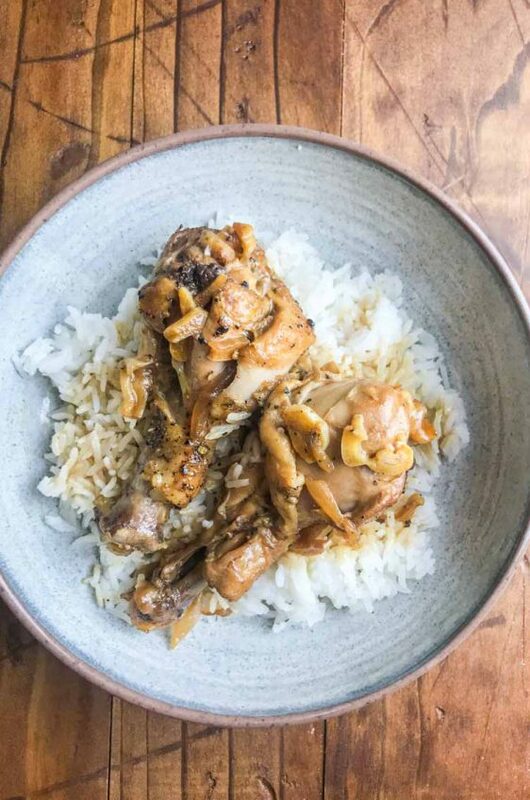 Yet at the same time, serve it in a pretty dish with a glass of pinot gris and your sweetie across from you and it makes a perfect date night at home. Set pressure cooker to saute. Add olive oil, onions and garlic. Cook just until softened, about 2 minutes. Add in rice. Stir to coat in oil. Make sure no rice is sticking to the sides of the pressure cooker. Cover and close the valve on the pressure cooker. Set to 6 minutes on high pressure. 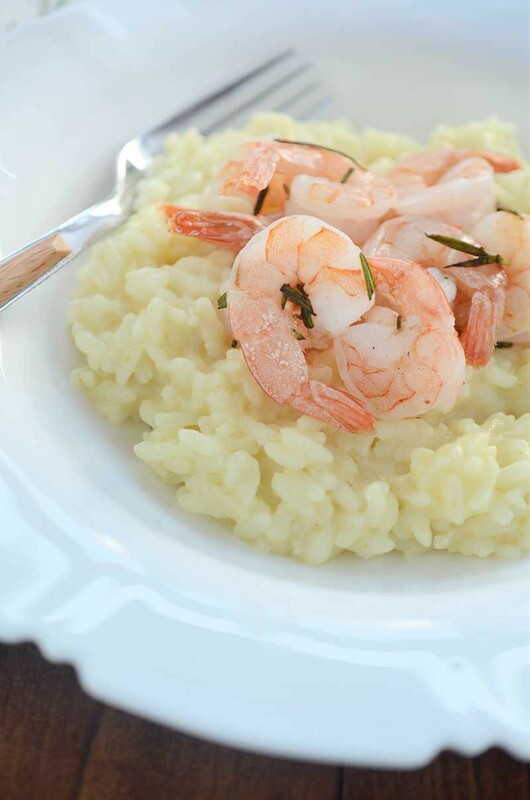 While risotto is cooking, toss shrimp with olive oil, rosemary, garlic and salt. Place on a baking sheet and bake for 5 minutes. When pressure cooker is done, do a quick release. Once the pressure has been released, remove the lid and stir in butter and parmesan. Mix well. Scoop risotto into a serving platter and top with shrimp. Serve immediately. This really looks like my kind of dish – so light and perfect! 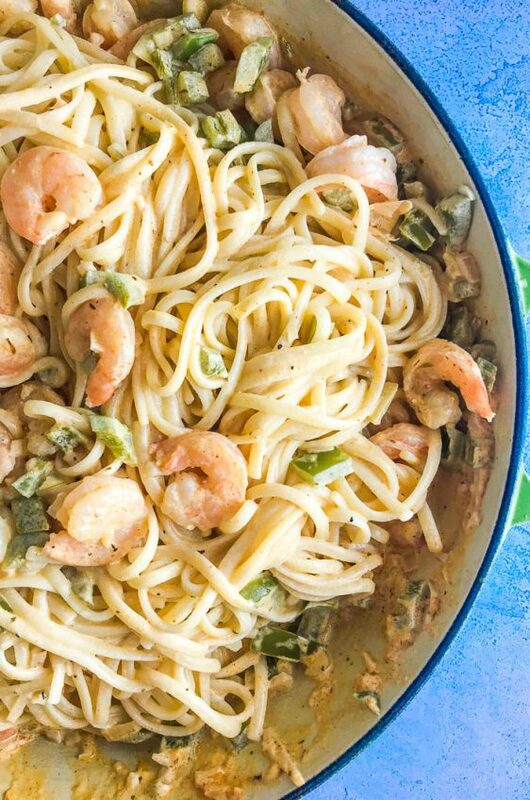 This is the perfect weeknight dinner!! Looks incredible!! 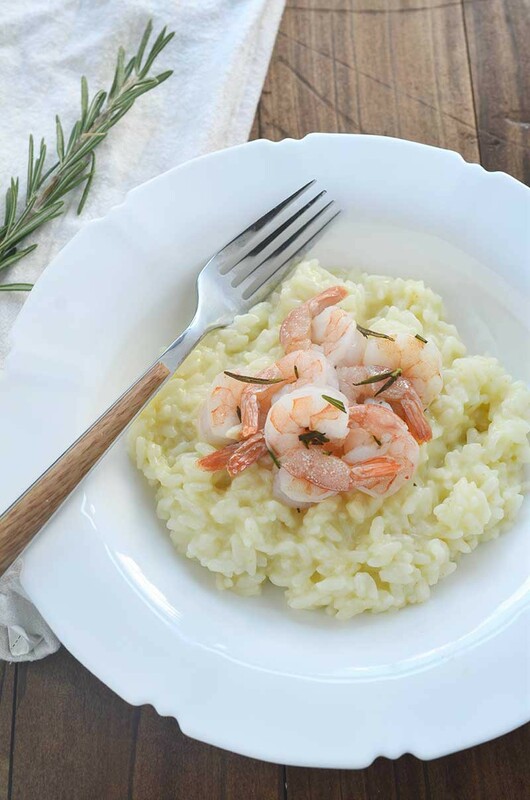 Yummm, loving the risotto and rosemary anything whether it be shrimp or any other protein. I got an instant pot on prime day too! I’m definitely going to give this a go! 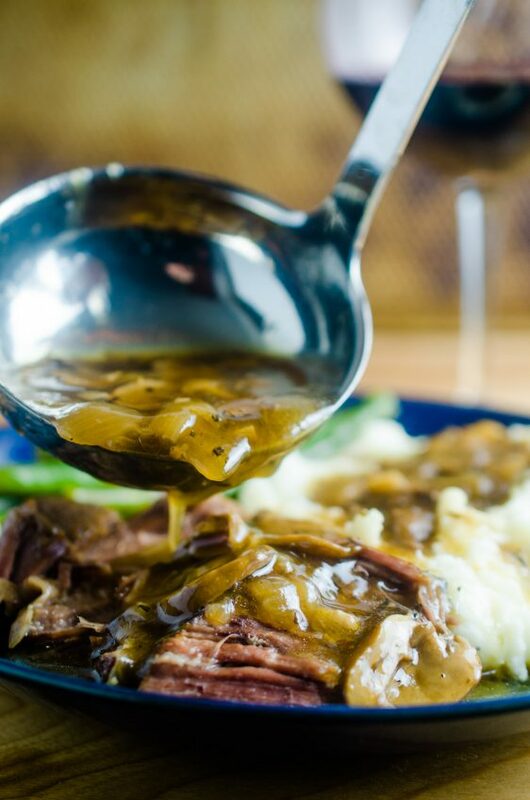 Such a beautiful dinner recipe and so quick so it is perfect for weeknight menu. Incredibly elegant dinner! It looks so delicate!